Place the mangos, onions, and bell peppers in a medium bowl, add the puree, and mix well. This salsa will keep, covered & refrigerated, 4 to 5 days. Cut the tomato in half crosswise; remove the seeds and strain, reserving 2 tablespoons of juice. Dice the tomato; then combine reserved juice and tomato in a bowl, and set aside. Place bell pepper half, skin side up, on a foil-lined baking sheet, and flatten pepper with palm of hand. Broil 3 inches from heat for 10 minutes or until blackened and charred. Place in a zip-top heavy-duty plastic bag, and seal; let stand for 15 minutes. Peel and discard skin; dice bell pepper. Add bell pepper, mango, and the next 6 ingredients to tomato mixture, and stir well. Cover and chill. Yield: 2 cups (serving size: 1/4 cup). Place all ingredients in a food processor or blender and puree. Serve with chicken and seafood, especially lobster. 1. Toast chiles in a hot dry skillet (not nonstick) over medium-high heat, stirring frequently. Transfer to a bowl, add 1 quart of warm water and let sit for 40 minutes. Drain, reserving 1 cup of the water. Transfer chiles to a food processor or blender. 2. Taste the chile water. If it isn't bitter, add 1/4 cup to the chiles. If it is bitter, add 1/4 cup tap water. 3. Add tomatoes, garlic, cumin, oregano and salt; process until smooth, adding more water if necessary to reach desired consistency. Per 2-tablespoon serving: 20 calories; no fat; no saturated fat; no cholesterol; 1g protein; 4g carbohydrate; no sugar; no fiber; 100mg sodium; 10mg calcium.. Note: Blacken fresh tomatoes by placing them under the broiler, over a stove-top flame or in an unoiled skillet (not nonstick) over medium-high heat. Toast cumin seeds and oregano leaves separately. Grind, then measure out 1/4 teaspoon of each. and puree. Stir in oregano. Place the tomatillos, garlic, sugar, and salt in a food processor or blender. Add the chipotles, adobo sauce, and cilantro leaves and blend briefly, leaving the salsa just a little textured. 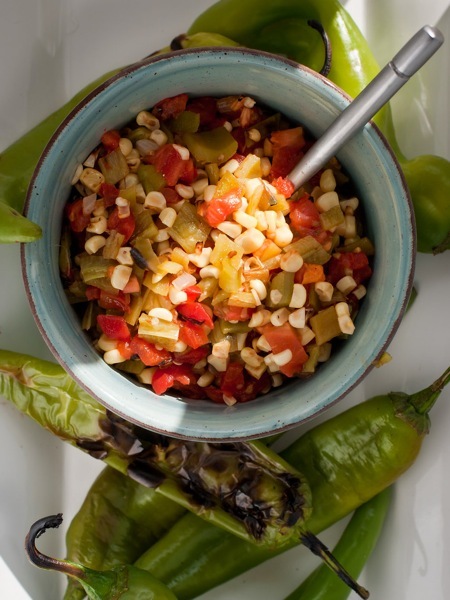 Variation: Add more chipotles for a more picante salsa. Serving suggestions: With red meat or pork. Serve with lamb or duck. This would be good with eggs, too. Carefully fold all the ingredients together in a mixing bowl. 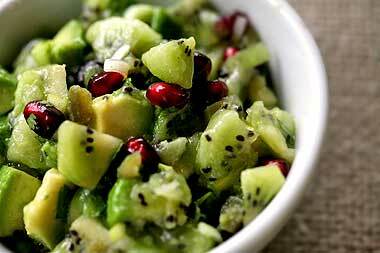 If making a few hours ahead, place the avocado pit in with the salsa to help prevent the avocado from turning brown. Carefully fold all the ingredients together in a mixing bowl. Thoroughly combine all ingredients in a mixing bowl. Serve with pork or firm-fresh fish such as mahi mahi. Throughly combine all the ingredients together in a mixing bowl. In a saucepan, cook the onion, garlic, ginger, tomatoes, chiles, pineapple, coconut milk, achiote, and bunch of cilantro over medium-high heat, uncovered, for 10 minutes. Remove the cilantro and continue cooking 5 to 10 minutes, until the mixture thickens. Transfer to a blender and puree; there should be about 2 cups of liquid. Refrigerate in the blender jar. When chilled, remove 1 cup of the liquid (reserve it for another batch of salsa or use it as a soup base or as a pasta sauce with shrimp or scallops). Add the mango, chopped cilantro. lime juice, and hot sauce to the blender and puree. Serve with fish and seafood, especially lobster. 4 teaspoons pure red chile powder. Purée all the ingredients together in a food processor or blender. Serving sugestions: With turkey, quail, or pork. Heat the oil in a pan and saute the pear with the sugar over medium-low heat for 2 minutes. Thoroughly combine with the remaining ingredients. Cook the dates in the water over medium-high heat for 8 to 10 minutes until soft and the water has reduced to 1 cup. Transfer to a food processor or blender, add all the remaining ingredients, and puree. Serve with meat, chicken, fish, or as a sandwich spread. In a saucepan over high heat, reduce the apple cider down to 1/2 cup. Lower the heat to medium, add the diced apple, and cook for 5 minutes until soft. In a skillet, saute the onion in the oil for 5 minutes. Add to the bowl, along with the remaining ingredients, and combine thoroughly. Place the grapefruit sections and juice in a mixing bowl. Cut the persimmon halves into sections the same size as the grapefruit sections, and add to the bowl. Thoroughly combine with the sugar, cilantro, chile sauce, and lime juice. Garnish with a few whole cilantro leaves. Variation: Add 1/4 teaspoon finely ground canela or ground cinnamon. Serving suggestions: With tuna, swordfish, or pork. Cut the corn kernels from the cobs with a sharp knife. Place in a large skillet over medium high heat and dry roast, stirring often, until browned and smokey. Transfer to mixing bowl. Heat the oil in a small saute pan and saute the onion over medium heat for about 5 minutes, or until translucent. Add to the mixing bowl along with the remaining ingredients, and thoroughly combine. Toast the chiles in a dry skillet over medium heat then rehydrate them in 1 cup of warm water. Drain the chiles and julienne in short strips. Cut the corn kernels from the cobs with a sharp knife (about 2 cups). Heat a large, heavy-bottomed saute pan or skillet over high heat until almost smoking. Place no more than two layers of the corn kernels in the pan at a time, and dry-roast for 4 to 5 minutes until smoky and dark, tossing continuously. Heat the oil in a saute pan over medium heat, add the onion, and saute for about 5 minutes or until translucent. 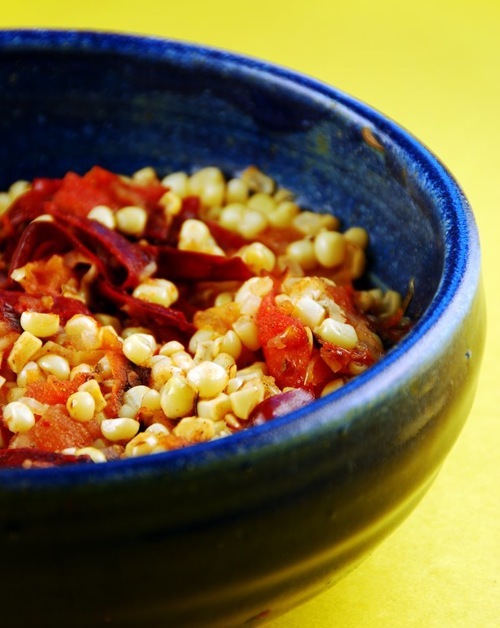 Transfer to a mixing bowl, add the julienned chiles, roasted corn, and remaining ingredients, and thoroughly combine. This salsa has a sweet, slightly smoky flavor balanced nicely with the toasted cumin and oregano. It goes well with pork, chicken or eggs. 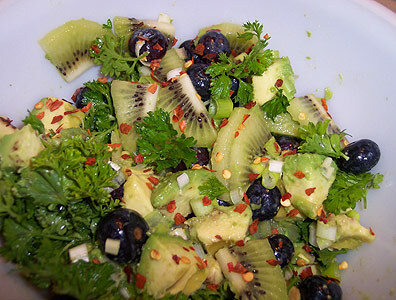 It is also a great side dish, burrito ingredient, or appetizer. Heat level is 5. Thoroughly combine all ingredients in a bowl. Serve with lamb, pasta, or as a sandwich spread. Cook the beans for 1 to 1 1/2 hours, or until tender, adding 1/3 teaspoon salt towards the end. Blanch the leek rings in 1/4 cup boiling water for 2 minutes, and drain. Heat the olive oil in a large saut'ee pan or skillet and saut'ee the leeks, mushrooms, and garlic for 2 minutes over high heat. Transfer to the mixing bowl. Add the bell pepper and green chile strips, thyme, lemon juice, and remaining 1/3 teaspoon salt, and combine. Garnish with the red Fresno chile rings sprinkled over the top. Serving suggestions: With pork or ham dishes. Cook the beans for 1 to 1 1/2 hours, or until tender, adding 1/2 teaspoon salt towards the end. Drain the beans, allow to cool, and transfer to a mixing bowl. Add the remaining 1/2 teaspoon salt and the rest of the ingredients, and thoroughly combine. Variation: Add 6 strips bacon, sauteed and diced (about 3 tablespoons). Serving suggestions: With beef or a meaty fish like swordfish or tuna. Nutritional Information: Per tablespoon: 8 calories; 0.5g fat; no saturated fat; no cholesterol; no protein; 1g carbohydrate; 0.5g sugar; no fiber; 25mg sodium; 5mgcalcium. Combine everything in a non-reactive bowl and chill until ready to serve. Serve with chicken or pork. It is also good withr fish and can be served with just chips. Heat Level is 5 - 6. Place the tomatillos and sun-dried tomatoes in a food processor or blender, and blend together. Then add the remaining ingredients and blend, leaving the mixture slightly chunky and textured. Serving suggestions: With duck or pork. In a large saucepan, bring the water and 2 Tbs. of the salt to a boil. Add the cabbage or other greens and cook for 30 seconds while stirring, until wilted. Drain, let cool, and transfer to a mixing bowl. Add the remaining ingredients and thoroughly combine. Serve with barbecued foods, especially ribs. Also with Chinese potstickers, fish tacos or sea bass. Heat the oil in a large saute pan or skillet, add the onion, garlic, curry powder, cayenne, coriander and cumin, and saute over medium heat for 5 minutes, stirring occasionally. Add the pureed pineapple, pineapple juice, tomatoes, sugar, and ginger juice, and saute for 10 minutes longer over medium heat until thickened. Let cool, transfer to a mixing bowl, and fold in the bananas. With rice as a vegetarian curry, lamb or goat. In a large saute pan or skillet, heat the water and wilt the spinach over medium-high heat for about 1 minute. Let cool, chop, and transfer to a mixing bowl. Sprinkle the remaining ingredients in layers over the spinach, starting with the ginger, then the chile powder, sesame seeds, daikon and vinegar, and finishing with the nori. Serve with cold rice or as a side dish with Chinese or Japanese food. Rinse the rice and place in a saucepan with 2 cups water. Bring to a boil and stir with a wooden spoon. Reduce the heat and simmer, covered, for 45 minutes to 1 hour, until tender and the water has evaporated. If the water evaporates before the rice is done, add more as needed. Remove from heat and let stand for 5 minutes. In a separate saucepan, bring the remaining 1 cup water and 1 tablespoon salt to a boil, add the quinoa, reduce the heat, cover, and cook until tender and the water has evaporated, about 12 minutes. Heat the peanut oil in a large saut'ee pan or skillet, season the mushrooms with 1/4 teaspoon salt and the pepper, and saut'ee with the garlic over medium-high heat for 1 minute. Transfer to a mixing bowl, add the cooked rice and quinoa, the remaining 1/4 teaspoon salt and the rest of the ingredients, and thoroughly combine. Serving suggestions: With grilled meats, especially lamb, venison, and buffalo. Place the tabbouleh and water in a mixing bowl and let sit for 30 minutes to allow the tabbouleh to absorb the water. Add the remaining ingredients and thoroughly combine. Serving suggestions: With grilled chicken, lamb, or fish.